Do you have organic waste? Sustainability is key to our long-term survival and well-being. Everything we require to sustain our existence can be derived from natural sources that are continuously renewed, and with proper stewardship, can never be fully depleted. Reliance on fossil fuels is the antithesis of sustainability, since these resources cannot be replenished within the span of human lifetimes. Fossil fuels are destined for ultimate depletion. When people think about sustainability, they tend to focus on natural resources that can be replenished. That’sonly one part of the picture. Often overlooked is the economic viability of obtaining those resources and the timelines of accessing them. 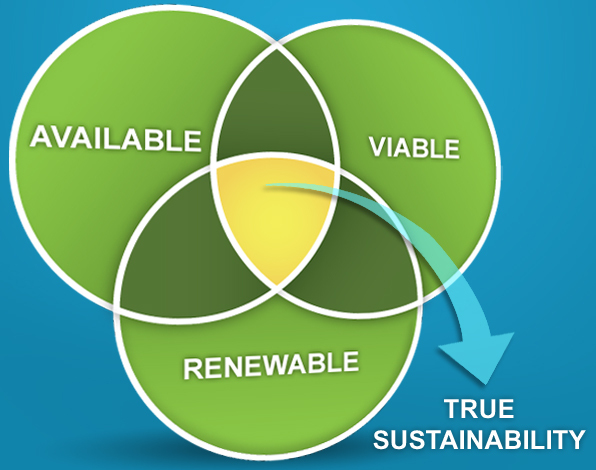 True sustainability only exists when a renewable resource is continuously delivered under economically viable terms. Many renewable energy resources commonly viewed as sustainable fail to meet the basic human needs for modern energy supply. They may not be available when demand is high (e.g., minimal solar availability during frigid nights in Alaska), or they may cost too much compared with other available energy sources (e.g., $150/megawatt wind power versus $30/megawatt conventional power). Global leaders and preeminent scientists have dramatically elevated awareness about the importance of sustainability to our future. There is heightened focus on transitioning from reserve-depleting fossil fuels to non-depleting bio-derived renewable fuels. From small communities to entire nations, there is a momentum building around energy independence and the thoughtful stewardship of our naturally reoccurring energy resources. At the same time, environmental scientists are learning more everyday about the negative impact of fossil fuel emissions on local air quality and, more broadly, on climate and the atmosphere. Many believe we are near environmental, ecological and atmospheric tipping points. Humans may not be able to change what has been done, but we can change what happens from here. We can change how we think about meeting our growing energy needs without upsetting the balance and jeopardizing future generations. Bio-derived renewable fuels play a key role in that change process. Have organics? We can help. Find out why biogas trumps fossil fuels in sustainability, and why people are focused on this ultimate renewable resource.